Chasing a stiff 183 run target vs Punjab, Buttler departed for 23 as debutant Arshdeep Singh claimed his maiden wicket in IPL. 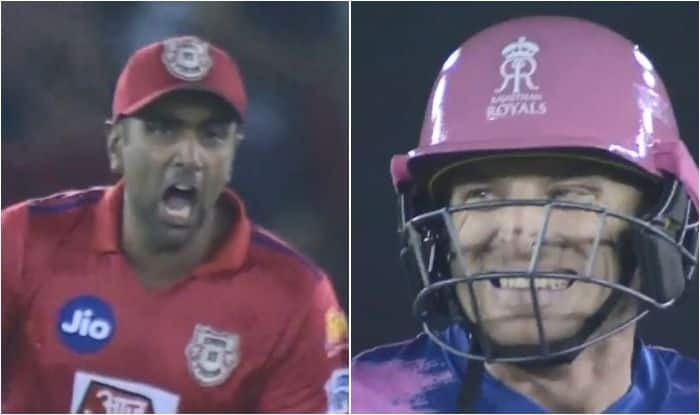 IPL 2019 Kings XI Punjab vs Rajasthan Royals: Adding a new chapter to their already much-talked-about rivalry, Ravichandran Ashwin-Jos Buttler maintained the status quo to become the center of attention during Kings XI Punjab vs Rajasthan Royals match in Mohali on Tuesday. Both Ashwin and Buttler became the topic of endless debates after the former ‘Mankaded’ the Englishman during their previous meeting in Indian Premier League (IPL). Earlier, opener KL Rahul cracked a patient fifty before a terrific cameo by skipper Ashwin powered Punjab to a challenging 182 for six against Rajasthan in a second leg IPL clash. Rahul, who was named in the World Cup squad on Monday, recovered after a slow start to post a 47-ball 52 studded with three fours and two sixes. He was ably supported by David Miller (40 off 27) as the duo shared a 85-run stand to lay the foundation. Ashwin then blasted a four-ball 17 in the last over as KXIP posted a good total on board. Pacer Jofra Archer (3/15) returned with an exceptional three-wicket haul to emerge as the best bowler for the Royals. Invited to bat, opener Gayle (30) smashed Jaydev Unadkat for a couple of sixes in the second over, before blasting Dhawal Kulkarni for a four and a six in the fifth over.